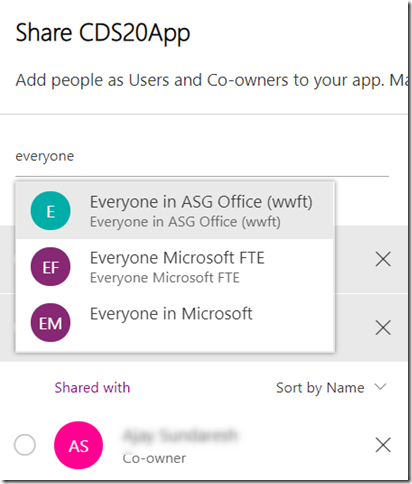 Today, the PowerApps team rolls out a brand-new sharing experience for canvas app. Check out the new look and feel! Not only is it a lot more responsive and meeting higher accessibility grade, it brings in several new features that are quite exciting. Starting with the most important improvement, we now list the data sources the app uses as part of sharing. This helps you remember to share your data as part of the app-sharing experience. We make it especially convenient with apps that are based on data in SharePoint and Common Data Service for Apps. 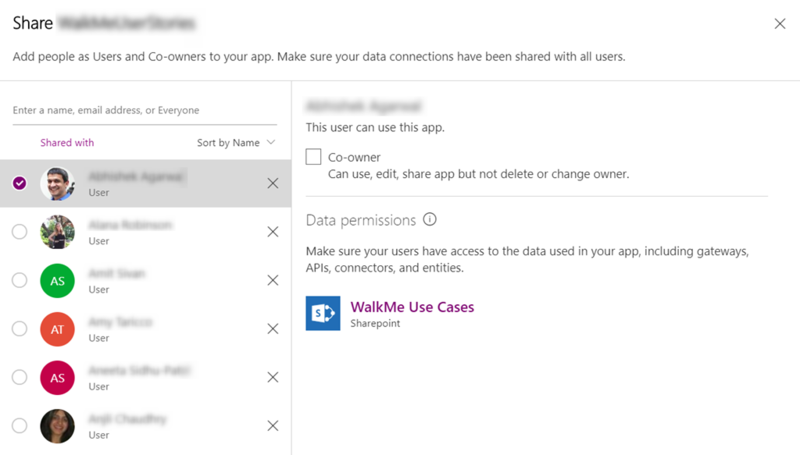 For SharePoint, we expose the SharePoint list link right inline. You don’t need to open your app or remember the URL anymore. 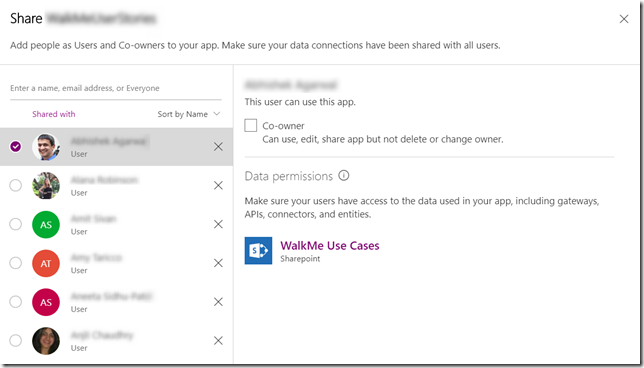 Simply select the link under Data Permission to configure access to the SharePoint list for your users. For Common Data Service for Apps, we list all the entities that your app uses and show you how to configure access to that data. You no longer have to find these instructions in our documentation; they’re available inline. Good bye to configuring permission one user at a time! As you add users, they’re selected by default. For example, if you add 10 users, permission configuration applies to all 10 users in a single click. Based on community feedback, we’ve made it a bit harder to accidently share an app with your entire organization. 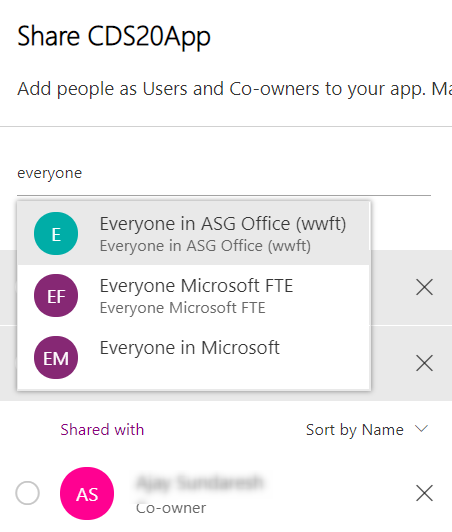 Instead of a simple checkbox, you must now explicitly type Everyone and then select the proper entry to share an app with everyone in your tenant. When you add users, the default permission is to run the app but not edit it. To grant them edit permission, select the Co-owner checkbox. Co-owners can use, edit, save, publish and share apps. Co-owners can add other co-owners but not change the owner or delete the app. You can also sort your list of users who have permissions by user name or permission type. You can see users’ profile pictures if the data is available. Let us know what you think of the new experience and where we can improve. 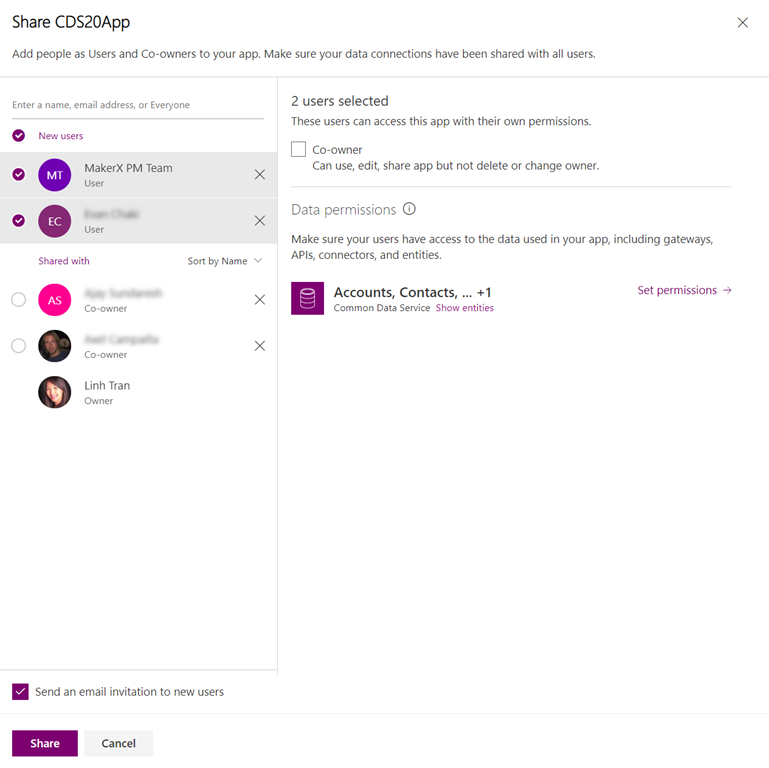 There is still more work in the pipeline to make sharing the data that your app uses easier, especially in Common Data Service for Apps. Stay tuned!